Monsoon Occur Every Year In Tucson AZ – Here’s Why! What is a “monsoon”? A frequent questions we hear from our clients. The word monsoon originates from the Arabic word “mausim”. It means season. Traders on the waters off the Arabian and Indian coasts saw dry northeast winds in the winter. But with summer, the winds turned to the southwest. That change brought torrential rains to the Asian landmass. Rains that were a benefit to the area. These wind shifts are the mechanism for the monsoon in southern Arizona. For a most of the year, low level winds of Tucson’s Sonora desert regions tend to blow from the land toward the sea. Sea being either the Gulf of California or Gulf of Mexico. The official monsoon season in Tucson AZ is from June 15 to September 30. During this period prevailing winds switch from the west to the southeast. That wind shift brings moisture from the Gulf of California and Gulf of Mexico. Increased moisture means a higher dew point. Most of Tucson’s summer days begin clear and very warm. As the day progresses, giant clouds develop and tower high into the sky and above the mountains. As the clouds rise, their temperatures cool. Cooler temperatures combined with higher relative humidity creates the possibility for rain. Rain that often dumping huge quantities of rain in a very short time in a very concentrated area. This summer rain period are the monsoons! 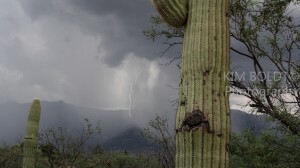 The monsoon “cloud bursts” create strong winds, lightning and flash flooding. Flash floods occur as rain comes off the mountains and channels into the washes in the foothills. As the water accumulates, it becomes deeper and moves faster. Real Fast! The summer monsoon in Tucson AZ, also trigger the appearance of many animals. For example, many amphibians emerge above ground and begin their hasty breeding period. These small creatures also search out the large colonies of ants and termites. Dinner is served! The welcomed rains of the monsoon signal a second desert wildflower growth in the surrounding Sonora desert. Ocotillo change from spinney sticks to green leaved and flowering bushes. The Tucson monsoon rains also stimulate many “summer” wildflowers and shrubs in bloom throughout the desert . The monsoon season does not produce thunderstorms every day. Instead, patterns known as “bursts” and “breaks” occur. “Bursts”, create disturbances in the upper atmosphere. Which in turn push thunderstorm activity over the state. These condition will last for a period of a few days to more than a week. As the disturbances continue, a “Bermuda” high may develop over northwestern Mexico. This leads to “breaks” in the monsoon. This cycle of “bursts” and “breaks” continues throughout the monsoon season. As cooler air returns in September, monsoon season comes to an end. At the end of September, the fabulous fall period and pleasant winters begins. Weather that makes Tucson AZ a sought after winter retreat. Are you thinking of buying a home in the greater Tucson area? Finding the right home can be challenging. But we can make the process much less stressful for you. The monsoon season is an annual event in Tucson and Southern AZ. Residents love it. Afternoon rains awake the desert beauty and feed the saguaro. Monsoon’s also bring a fantastic lightning show. It is something to behold. Thinking of moving to Tucson OR perhaps considering a winter get away OR future place to retire? We can help!